Shore Docker™ Boat Ramp Systems are the innovative and economical way to dock your boat, personal watercraft or pontoon. Imagine the security of storing your boat on dry ground! 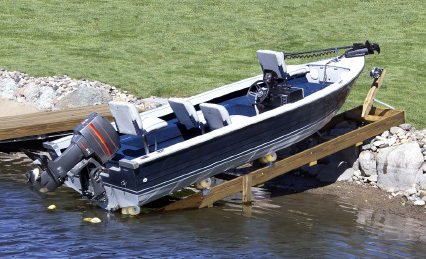 Everything is included for these simple-to-build, DIY boat roller ramp docking kits except pressure treated lumber. Instructions easily guide you through building your customizable DIY shore ramp kit including hints on how to add supporting legs and join extra sections. There are three models, each comprised of hot-dipped galvanized steel, aluminum, and stainless-steel parts. All bracing, brackets and fasteners are included with each model and accessory kit. PWC docking kits (jet ski lifts), boat docking kits, pontoon docking kits – ShoreDocker kits are the perfect way to dock your watercraft on shore!